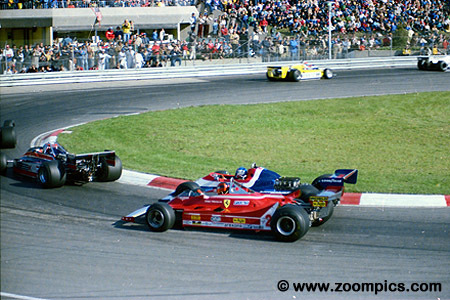 The 1980 Canadian Grand Prix was held at the 4.41-kilometer Circuit Ile Notre-Dame later re-named Circuit Gilles Villeneuve. 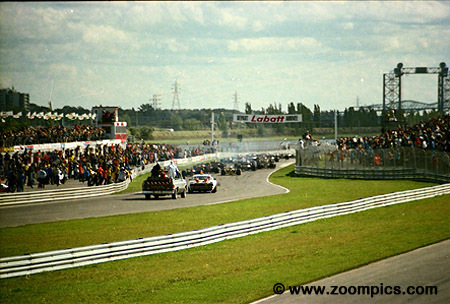 This was the third time the track was used for a Formula 1 race and would become the permanent home of the Canadian Grand Prix. The race length was 70-laps for a total distance of 309-kilometres. The final two races of the World Driving Championship would take place in North America. There was a great deal of excitement heading into Montreal and Watkins Glen as Alan Jones and Nelson Piquet were separated by one point in the battle for the Championship. To add to the drama Piquet and Jones qualified first and second, respectively. 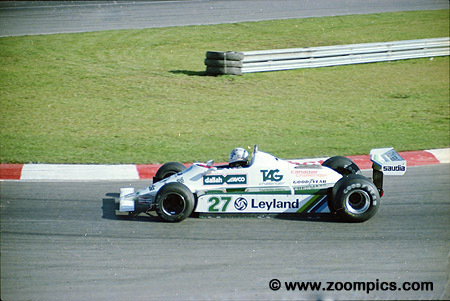 Alan Jones, driving a Williams FW07B, won his second consecutive Canadian Grand Prix. At the start he and pole-sitter Nelson Piquet touched in the first corner causing a multi-car pile-up. Piquet's car was damaged in the incident and he was forced to use his back-up car. The engine in Piquet's Brabham BT-49 failed on lap-24. 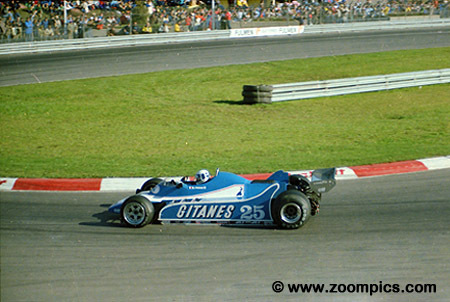 Piquet's DNF allowed Jones to win the 1980 World Drivers Championship. Jones' teammate in 1980 was Argentine driver Carlos Reutemann. 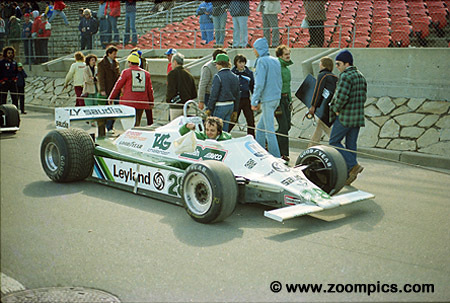 At Montreal Reutemann qualified fifth and finished second. He scored one win in 1980 - the Monaco Grand Prix - and finished third in the World Drivers Championship. 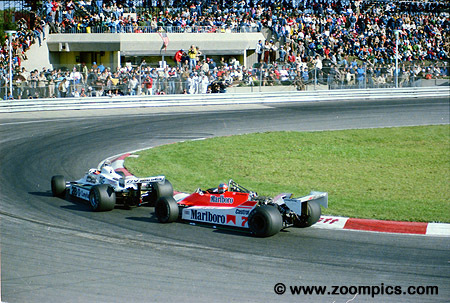 On lap-6, Ricardo Patrese's late braking attempt on Alain Prost at the hairpin resulted in contact. Prost driving a McLaren M30 was able to continue but on lap-41 a suspension failure caused him to crash. Patrese in an Arrow A3 would retire as the result of this collision. Didier Pironi was penalized 60-seconds for jumping the re-start. To overcome the penalty Pironi put on a charge in his Ligier JS11/15 which resulted in him setting the fastest race lap and finishing third. John Watson in a McLaren M29 chases Carlos Reutemann driving a WilliamsFW07B. On the seventh lap, Watson passed Reutemann for fourth place. He ran third for much of the race but was re-passed by Reutemann on lap-56 when he had a spin - he finished fourth. Twenty-four of the fastest qualifiers take the green with the chase vehicles in tow. Little did they know that their services would be needed. The No. 3 Tyrrell 010 driven by Jean-Pierre Jarier was one of the eight victims of the turn one crash. The others involved in the incident were Piquet, Rosberg, Fittipaldi, Andretti, Daly, Mass and Villeneuve. As the senior member of the team, Jarier re-started the race in the car qualified by Mark Thackwell. This was Thackwell's first Grand Prix and at the time he was the youngest driver, at 19-years of age, to start a Formula 1 race. 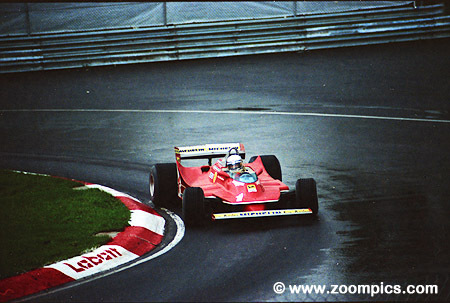 Gilles Villeneuve starts a spectacular charge from the back of the grid. 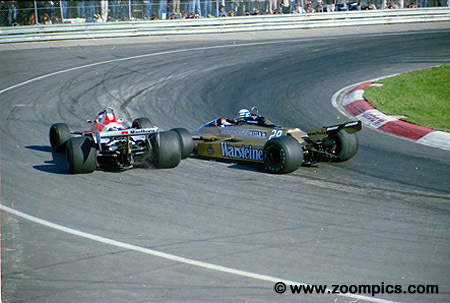 At the hairpin he attempts an outside pass on Jan Lammers in the Ensign N180. 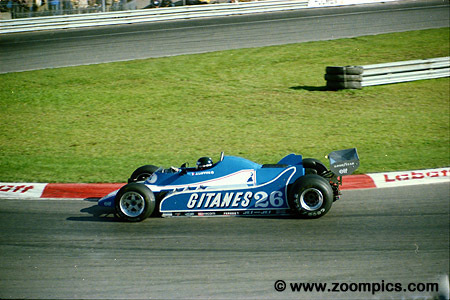 Despite qualifying twenty-second and being involved in the first lap multi-car accident, Villeneuve was able to finish fifth. 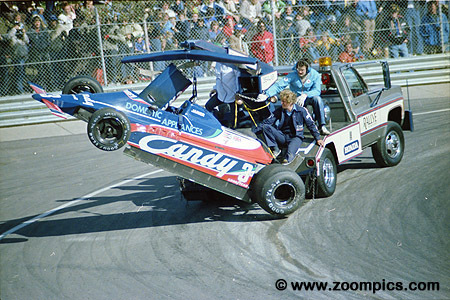 This would be 1979 World Driving Champion Jody Scheckter's last season. Unfortunately, his career ended with the Ferrari 312T-5 which was an uncompetitive car. Scheckter set the twenty-sixth quickest time in qualifying - not fast enough to make the starting field. 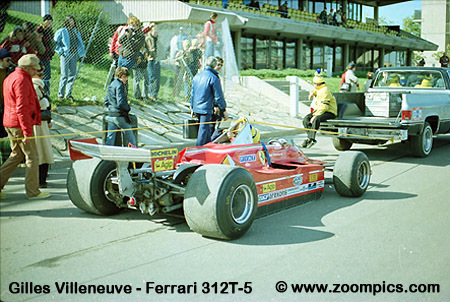 This was the first time a Ferrari failed to qualify for a Formula 1 race. The No. 26 Ligier JS11/15 of Jacques Lafitte qualified ninth. With 2-laps to go, he was on the lead lap running fourth. But he ran out of fuel and was classified in eighth.